The movie, The Last Emperor, follows the life story of the last emperor of china. The interesting thing about this empero r is he was taken from his home and appointed at the young age of three. A critical aspect of the film is how the emperor’s clothing changes over time in relation to the events that occur around him. To start off, lets begin with the first picture. 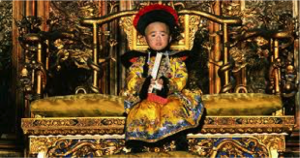 We see in this picture the three-year-old emperor at his coronation ceremony. He is dressed in traditional Chinese emperor attire that entails the robe, hat and the color yellow. The color yellow is significant because in traditional Chinese culture only the emperor could wear yellow. By him wearing yellow we see that Chinese traditions are still in tacked in this section of the film. Another thing to take notice of in the emperor’s outfit is how large it is. It is interesting to see such a small child in the attire an older man would wear. The proportions facilitate the strangeness of such a young child becoming the ruler of an empire. 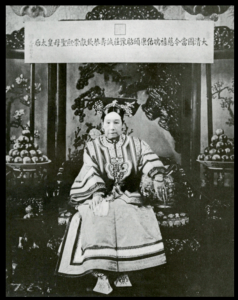 The next picture is a snap shot of the grown emperor, his wife, and his mistress in a car no longer in the Forbidden City. Th e emperor is wearing a European traditional black and white tuxedo. His women are wearing traditional western dresses and accessories. This outfit change is very noteworthy. We see here that the three are totally disconnected to there traditional past in this point of time. They are no longer in the Forbidden City and have since broken away from that lifestyle. A few more things to notice about the outfits in this scene are the emperor’s glasses and his short hair cut. In traditional Chinese culture the emperor would never wear glasses and never cut his hair. The fact that he has done both shows that he has left his role of emperor in the past and trying to assimilate into western culture. By looking at the contrast of the first and second pictures we can see the transition the emperor had to make as he was kick out of his empirical home. Outfit choices in movies help aid the story line and bring forth important ideas that that are not necessarily spoken. This entry was posted in The Cinematic - Fashion in Film on May 11, 2016 by cpratt. Through the next three photos we can see the rise and effect of the Mao suit on the culture and government of China. 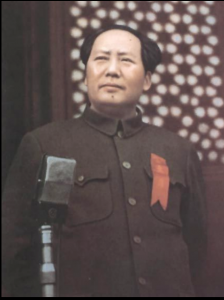 The Mao suit originated with the rise of the Republic of China and its founder, Sun Zhongshan (1866-1925) and Mao Zedong the founder of the People’s Republic of China (1893-1976). The picture above is a picture of Mao Zedong in a Mao Suit. To be fair it was really Mao and his policies that popularized the Mao Suit. 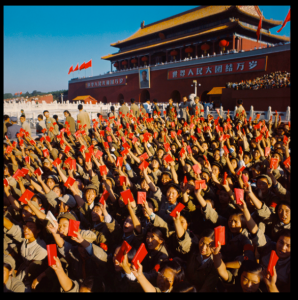 The Mao suit resembled and emulated the policies of the government and society of the time or at least what Mao wanted to achieve in both categories. As seen in the picture above there are a few aspects of the Mao suit that are consistent and have inner meaning. 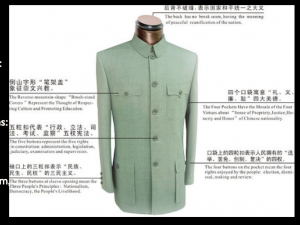 Four examples, each Mao suit have four pockets representing four principles: Propriety, justice, honesty and sense of humor. Also, there are five centre-front buttons to represent the five powers of the constitution of the republic. Finally, each Mao suit has three cuff-buttons to stand for nationalism democracy, and people’s livelihood. 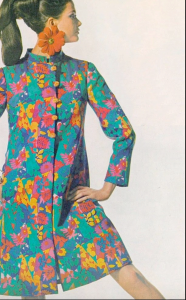 When the Mao suit was implemented everyone in the country wore one. Everyone looked the same. The picture above we see a group of Chinese people , looking at it you can barely tell the distinguish the people from each other let alone determine the gender of the subjects. So what impact does uniformity through apparel effect the society? When you have to dress exactly like everyone else you loose your own sense of self you then become part of a whole and not an individual. This loss of individuality is on track with the ideals or policies of Mao’s Communist China. Loosing all the capitalistic aspects of fashion from society helped eased the transition and drove communism in china forward. This entry was posted in Fashion and Gender in China on March 30, 2016 by cpratt. 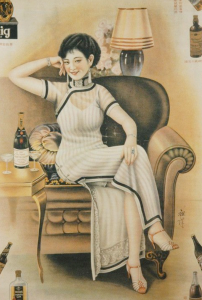 the idea of transition sounds, but the question of how the transition is made in terms of qipao denotations are not sufficient, persuasive enough. This entry was posted in The Modern - Qipao on March 2, 2016 by cpratt.